Soyuz 2 - Universe Galaxies And Stars Section. 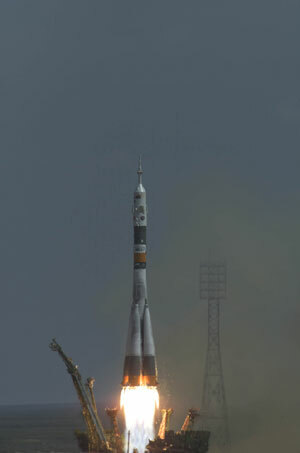 The maiden flight of a Soyuz 2-1a launch vehicle took place on Monday 8 November 2004 from the Plesetsk Cosmodrome in Russia at 21:30 Moscow time (19:30 Paris). Starsem, Arianespace and their Russian partners report that the mission was accomplished successfully. This launch marks a major step forward in the Soyuz evolution programme as this modernised version of the launcher implements a digital control system providing additional mission flexibility and enabling control of the launch vehicle with a larger fairing. The next step will be the introduction of the Soyuz 2-1b. This launcher version will have a more powerful third-stage engine to significantly increase the overall launch vehicle performance and provide additional payload mass capability. The inaugural flight of the Soyuz 2-1b is presently scheduled for mid-2006 from Baikonur. Both new versions of the Soyuz launcher will be adapted in view of their exploitation by Arianespace from the Europe’s spaceport in French Guiana. This will be made possible through the "Soyuz at CSG" ESA programme, which encompasses the development of a Soyuz launch complex on the territory of Sinnamary and participation in the Soyuz 2-1b development. The Soyuz at CSG programme is a key building block in the implementation of strategic cooperation between ESA and the Russian Space Agency, which falls under the general framework of the Agreement between the Government of the Russian Federation and ESA on Cooperation and Partnership in the Exploration and Use of Outer space for Peaceful Purposes, signed in Paris on 11 February 2003. ESA’s decision to open the CSG for the exploitation of the Soyuz ST launcher from Europe’s Spaceport in French Guiana is a major step forward in reinforcing the range of accessible missions that can be performed from the Spaceport. The versatile and flexible medium-class Soyuz ST launch vehicle, together with the heavy-lift Ariane 5 and the Vega small launcher will provide Arianespace with a family of launchers enabling it to cost-effectively perform the full spectrum of commercial and institutional missions from French Guiana. The inaugural flight of a Soyuz ST from French Guiana is scheduled for 2007. "We share the excitement of Starsem, Arianespace and their Russian partners for the successful launch of the new Soyuz 2-1a model and we will continue to strive to accomplish what we have started: to bring Soyuz to the European spaceport as soon as possible to enhance Europe’s launch capabilities" says Jean-Pierre Haigneré, ESA’s Soyuz at CSG Programme Manager.